It was very hard to pull ourselves away from The Elms Mission in Tauranga. But we had to… we had an afternoon visit arranged about an hour down the road in Whakatane. Whakatane Museum https://www.whakatanemuseum.org.nz/ is closed for a year + long complete refurbishment. So it was the beautiful Te Kōputu a te whanga a Toi – Whakatane Library that the museum made available for our visit. All except the newest aquisition can be seen in Pamela Fitz Gerald’s book Warm Heritage… see previous blog post for purchase details. 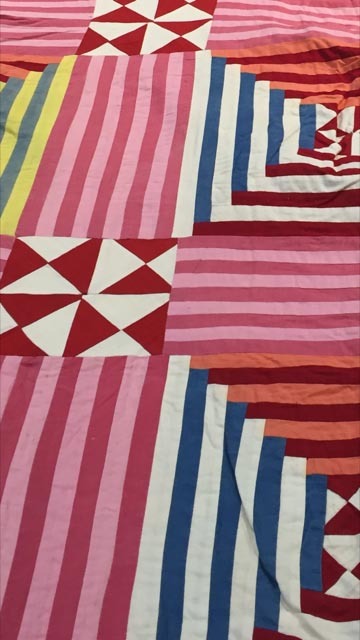 The first quilt we saw was Sarah Pridhoe North’s red and white quilt. It was made in England prior to Sarah’s arrival in NZ in 1870. This quilt we were asked not to share photo’s of. However there are a couple of photo’s in Pamela’s book. Next we saw an English Medallion c 1870. 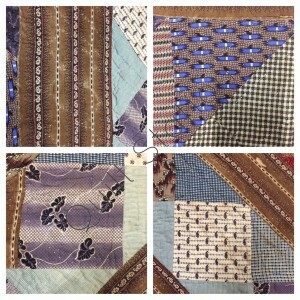 A large red star centre is surrounded by borders featuring some very beautiful prints in purples and blues. Along with a vermiculate and paisley border stripe in brown, which may have once been purple. C 1870 English Medallion maker unkown. Whakatane Museum and Arts. Next up was a traditional Pacific Island bed covering (Tivaevae) c 1930 it uses plain fabrics in a log cabin design. What looks like striped fabric is in fact pieced. Continueing with the Polynesian theme, we then studied a red and white applique coverlet. 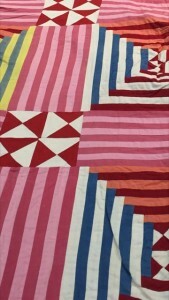 Made in Rarotonga, it uses applique techniques similar to Hawaiian quilts. Four large American eagles, each with a shield and holding arrows. A large and ornate eight point star is featured in the centre fo the design. 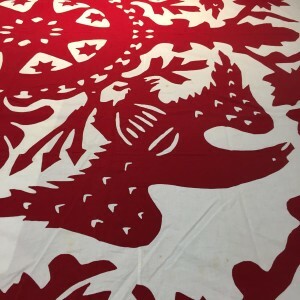 There are seams (two) in the red fabric to make a piece large enough to applique on to the white sheet. the coverlet measures over 100″ . Maker unknown. Rarotonga applique coverlet detail. Maker unknown. 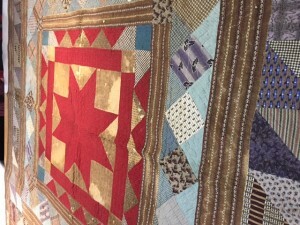 The last quilt we saw was the newest aquisition, photo’s permitted but not to be shared as yet I’m afraid. 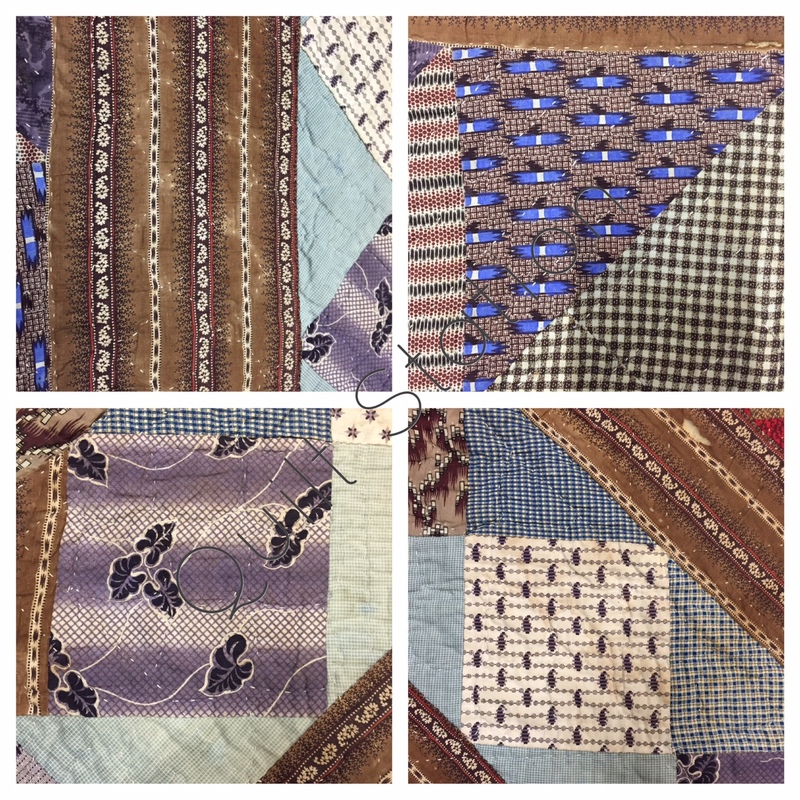 A lot of time was spent studying this Crazy Quilt carefully as it is quite fragile. The museum staff had arranged an afternoon tea afterwards, and that rounded off a full and busy day beautifully. A heartfelt thank you to Paula Karkkaine, Curator of Collections at Te Whare Taonga o te rohe o Whakatane, Whakatane Museum and Arts. 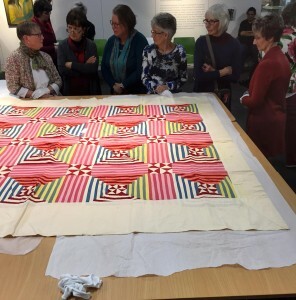 It was very special indeed to have the staff take time out from their busy schedule during the upheaval of refurbishment and to make these quilts availabe to us to view and study. I’m going to wrap up today’s posting as the next museum and quilt is the stunning Broderie Perse quilt from Te Aroha. my tummy is rumbling, I’m a wee bit peckish and it’s getting close to dinner time now. PS Don’t forget to click on the photo’s to enlarge. I'm really glad you've stopped by and love to read your comments. Since changing to the new look website it's been less obvious how to go about it. Please click on the title of a blog post, scroll to the bottom of the post and you will then be able to leave a comment. I look forward to hearing from you.